Welcome to Show and Tell Friday!!! 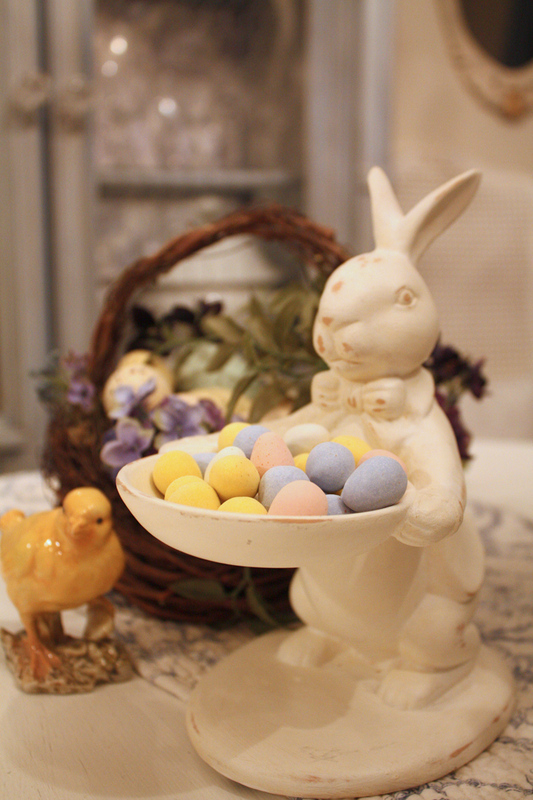 This week I'm sharing a few more of my Easter decorations. I did another post earlier in the week so scroll down if you haven't seen those yet! Those candies are Cadbury Mini Chocolate Eggs and they are one of my favorite easter candies. My absolute favorite Easter candies are the Cadbury Creme Eggs! I found that people either love those or hate them! I LOVE LOVE LOVE them! It's a good thing they are only available for a short time each year! I have a hard time resisting them! To me, they are worth each and every 150 calories that are in them! Enjoy those chocolate eggs! Wishing you and your family a blessed Easter. Thank you for hosting. Have a wonderful Easter! Happy Easter! Thanks for hosting. Thanks so much for hosting...have a great Easter! Beautiful Easter decor! Congrats on the Bingo! Have a wonderful Easter! Thank you for hosting! I have the same bunny! Thanks for hosting and Happy Easter. Enjoy your chocolate eggs -- after all, they'll be unavailable again till next year! 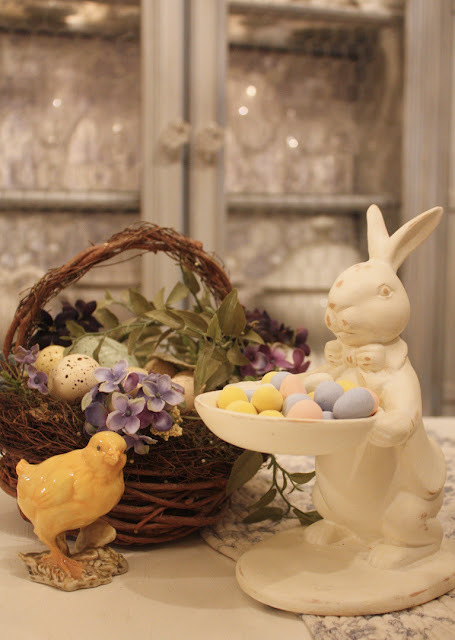 What gorgeous decorations, just love the pastel colours, have a wonderful Easter! Thanks so much for hosting Cindy and have a wonderful Easter! LOL! I love those mini Cadbury eggs...I actually did a post on them early this week... :) I better go buy a bag before they are gone. Beautiful basket and I the rabbit with his Easter eggs is delightful. 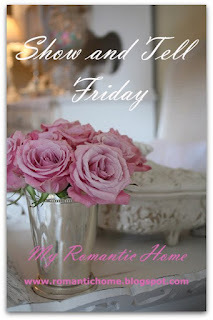 What a cute idea, the Show and Tell Friday :) I never knew about it until just now! Thanks so much for hosting Cindy!! Hope you have a wonderful Easter! Have a wonderful Easter and thank you for hosting a great party! Love your Easter treats! Have a wonderful holiday! I love your bunny with the mini eggs. I just brought out my Easter things this week too...the bunnies make me smile! Thank you for hosting Show and Tell Friday. I love making new blog friends. Hello and good morning! I have a 3 Minute Fudge recipe that was so good when I tried it, I knew I had to share. Obviously, it's easy to make and oh so yummy! Hope you enjoy! Thanks for hosting the party once again. Have a great week! I LOVE those cadbury eggs.And so does my daughter.My husband hates them.That's alright more for us.Thank you for hosting.Have a wonderful Easter. Thank you for the party Cindy! Have a fabulous Easter weekend! Easter Blessings to you and your family. Thanks for hosting! Thank you for hosting, have a blessed Easter! My husband LOVES those cadbury eggs...I can't stand to even watch him eat it! So I totally get what you are saying! Thanks so much for hosting your linky party. I hope you have a wonderful Easter with your family. I love the Easter bunny holding the jelly beans. What a sweet vignette. Thanks for hosting. Have a magnificent weekend! 35 and still loves them and expects them for Easter. I love your little chicken, it is so cute. Where did you find him? I love when you show your decorating. Elsie, I bought the little chick at Michaels a couple years ago. Lovely Easter decorations! Have a Happy Easter! Thanks so much for hosting and have a very Happy Easter! I have been reading your lovely blog for many years and I really appreciate your writing a manual for furniture refinishing and being kind enough to share it with us. Have you ever considered writing a manual about how to write a successful, income-generating blog? I would certainly pay for your expertise. very nice collections, use Gift to India site to use service for sending gifts to India express and midnight delivery. Send Rakhi gifts to india on this wholy rakshya bandhan. A nice place t be. Very relaxing views.